My first NOTD!! Had a few minutes spare so I rushed upstairs to grab a polish and make my nails pretty! I used to paint my nails all the time but now its hard to find the time! I grabbed Barry M 305 in pink flamingo! 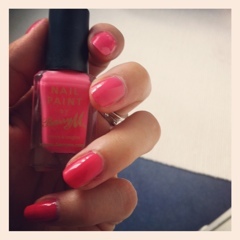 Its a bright pink shade for the summer...brightens any outfit any day. Lets hope this shade encourages the sun to come out! Well one can hope!